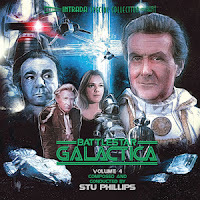 Fourth and final volume of classic Stu Phillips music for 1978-1979 cult TV sci-fi epic from Universal, featuring Lorne Greene, Richard Hatch, Dirk Benedict. This exciting 2-CD set presents scores for two of series most ambitious two-part episodes, "The Living Legend", "War Of The Gods". Former episode score offers military theme for Commander Cain (Lloyd Bridges), haunting line for Cassiopeia (Laurette Spang) plus plethora of space battle action material. Latter episode brings powerful contrast between good and evil with Count Iblis (Patrick MacNee) getting dramatic "devil" motif battling against "angelic" music for mysterious light ships, with gentle harmonies featuring women's chorus getting spotlight. 5/5 If your a fan of the series, you will need to add the score to your music library and it's the last. The Roxy Gunn Project "On With The Show"
DJANGO KILL!...IF YOU LIVE, SHOOT! Intrada Hits Hard as the Year Comes to an End!! !